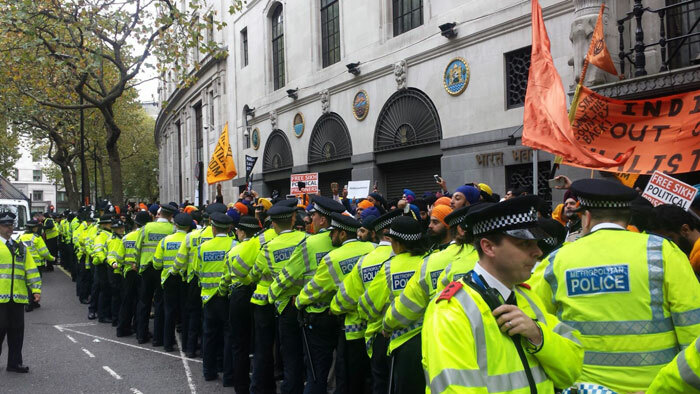 Home Sikh Events Why sikhs took to streets in london ? A trending social media hashtag – #SikhLivesMatter, candlelit vigils,demonstrations, and a BBC guest going off topic have in recent weeks highlighted the predicament facing Sikhs in India. On 22 October, hundreds of police officers, including mounted units cleared a protest in London,where a minority clashed with officers. What lies behind the protest? To answer this question, one has to travel to events 4,000 miles away to the north Indian state of Punjab. Earlier in October, two Sikhs were shot dead by Punjab police, following protests in response to the desecration of a copy of the Sikh holy book, the Guru Granth Sahib. Bullets, water cannon, and lathi (cane) charge were used to disperse protesters, highlighting the brute force used by authorities to clamp down on innocent civilians. Graphic images of those murdered, along with the horrific injuries inflicted by police, were disseminated widely via social networks and Sikh satellite television channels. BBC presenter Sian Williams was visibly ruffled by her guest’s impromptu statement. The campaign was later given significant impetus with the trending #SikhLivesMatter. There are, however, some less obvious issues at play – namely agribusiness. The Punjab is widely known as the agricultural heartland of India. It remains one of India’s wealthiest states and has been dubbed India’s “breadbasket”. In recent months, farmers, or kisan, have suffered immensely. Whitefly has decimated two-thirds of Punjab’s cotton crop, and 15 farmers have committed suicide. Weeks prior to protests in response to desecration of the Sikh scriptures, farmers’ unions were the ones organising protests, and for good reason. The Director of Punjab’s agricultural department was arrested for the alleged supply of “spurious” pesticides to cotton farmers. From September to early October, they lobbied for state compensation – by blockading major transport routes. They made some progress following a six-day “Rail-Roku” (sitting on railway tracks) agitation but not all their demands were met. Opposition politicians supported the farmers in their demands for higher compensation for the failed cotton and Basmati crop. But on 12 October, a new wave of protests began in Punjab’s cotton belt, however this time ignited by desecration of a copy of the Sikh scriptures. The spotlight conveniently moved from the woeful treatment of farmers, to the murder of protesters from the very same rural communities. According to the Sikh Press Association: “The Indian government and Punjab Police have killed two Sikhs and brutalised many in Punjab who were peacefully marching against the police lack of action towards finding the culprits of desecration of the Sikh Scriptural Guru, Sri Guru Granth Sahib ji. 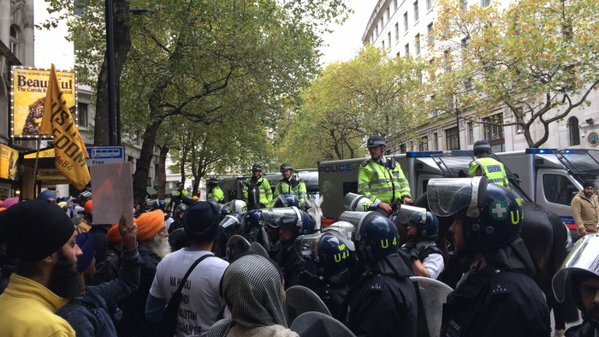 If this treatment continues and the media fails to report it, it will likely not be the last time Britain’s Sikhs take to the streets.